The meeting will be held at The Hilton Los Angeles Airport, 5711 West Century Boulevard (Tel: 1-310-410-4000). 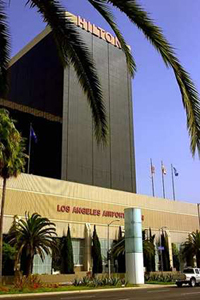 The hotel is, as the name implies, situated next to the Los Angeles International Airport (LAX). There are free shuttle buses to the hotel from the airport 24 hours and every 15 minutes (the buses are light blue and labelled "Hilton LAX"). A taxi to the hotel costs approximately $20. The hotel offers all the amenities you would expect from a high-end hotel chain. 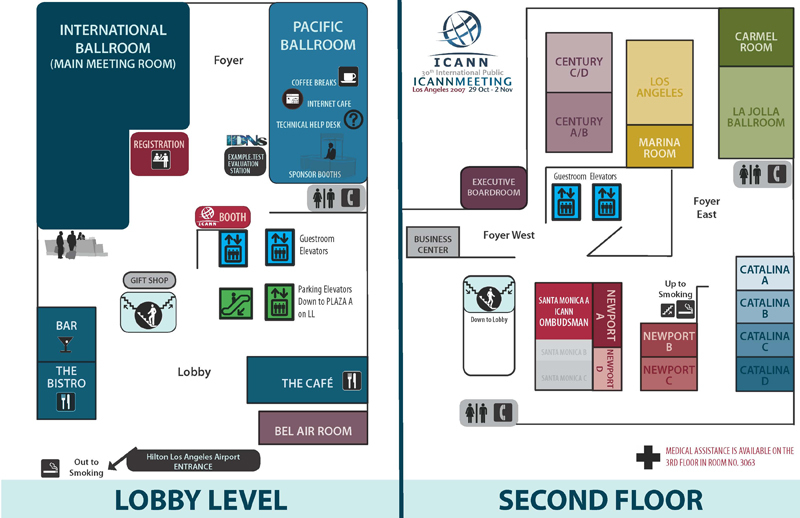 Alongside the conference centre that the ICANN meeting will be held in, there is also a business centre, an ATM, car rental desk (vital if you plan to travel about Los Angeles), foreign currency exchange, a laundry service, a concierge and a swimming pool. The block of rooms at the Hilton Los Angeles Airport initially offered at a special rate of $149 per night for attendees at the ICANN Meeting is now completely sold out. Due to the overwhelming number of requests, the Hilton has made an additional block of 50 rooms available for meeting attendees at a special rate of $259 per night for a standard room, single or double occupancy. To take advantage of this, click on this link to go through to the ICANN meeting portal on the Hilton's website to book your room. The hotel has a cafe open from 6am and closing at 10pm; a bistro open from midday to midnight; an Italian restaurant open in the evening; and a sports bar that closes at 1am. There is 24-hour room service. Los Angeles has no shortage of restaurants, with literally several dozens within 10 miles of LAX. Please email recommendations with a quick summary, the names and address to public@icann.org and we will post the most popular here. If you are driving to the hotel, take the 405 freeway and exit at Century Boulevard. Go west five blocks and the hotel is on the right side. If you are coming in from the 105 W, exit at Sepulveda Blvd and follow signs to Century Blvd. Once on Century Boulevard, go past the hotel (on the left-hand side) and make a U-turn at Bellanca. Turn right into the hotel. Parking is $14 plus tax or $18 (plus tax) for valet parking. For a map of the exact location click on this link. Depending on traffic, it will take approximately 20 minutes to drive to Santa Monica; 30 minutes to get to Beverly Hills; and 40 mins to Hollywood Boulevard. For information on other hotels near to the Hilton covering a wide range of different rates, please click on this link.